A recent poll indicates that a many Americans do not completely understand the conditions related to learning disabilities. There appears to be a growing public awareness of LD and an understanding that some kids learn differently. But the poll shows that some people do not have a very clear idea of what dyslexia, dyscalculia, and other learning disabilities are. About 80 percent also linked learning disabilities with intellectual disabilities (referred to as “mental retardation” in the poll); 69 percent with attention deficit hyperactivity disorder; and 75 percent with autism. The poll was commissioned by the Emily Hall Tremaine Foundation, which makes grants to support children with learning disabilities. The report says that 79% of parents and 80% of non-parents incorrectly associate mental retardation with a learning disorder. Others chalk learning disabilities up to laziness. Some people also link learning disabilities to other disorders, such as blindness or deafness. The poll also showed that teachers — who 31% of parents say they would turn to for information about learning disabilities — are equally confused. 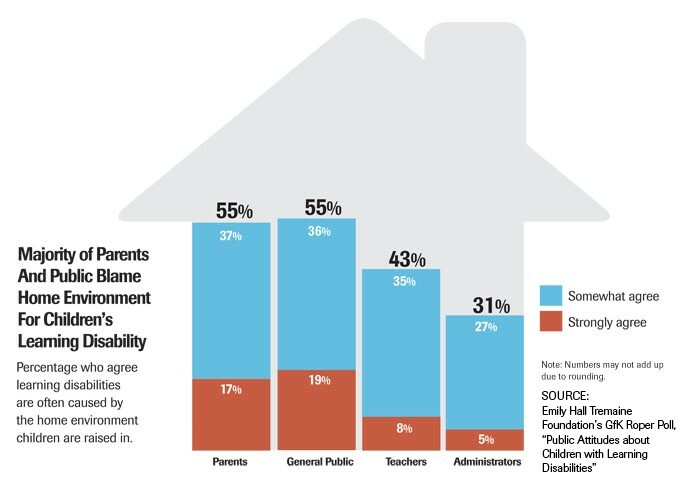 Forty-three percent (43%) of teachers think the home environment is at least partially to blame for children’s learning disabilities. This entry was posted in Advocacy, Learning Disabilities & Dyslexia and tagged Dyscalculia, Dyslexia, Learning Disabilities, Tremaine Foundation by Wrightslaw. Bookmark the permalink. Parents must understand the school’s perception of their child before they can advocate effectively. Do not allow blaming the child or blaming the parents to divert you from the real objective – getting appropriate services for your child. This is where well done evaluations are critical. Also, if you have more than one year’s data, making graphs can really bring the point home. When we do not accept blame, and do so without defensiveness, we place the focus back on the child, the eval results, and development of the goals. Whatever the “cause” may be, a student who is not at grade level in reading, writing or math needs teaching based on research, not consequences. Thank you once again Pete and Pam for putting info out there!